Okay, I’ll have to explain why no updates. First off I did update a September 6th post today so scroll down if you want to see that very late posting. I’ve been sick since September 4th. After work I felt like I had a horrible sunburn on my back on the left side which is believable since I was in the scorching sun all that Sunday shooting photos, schlepping around about twice as much gear as usual due to some equipment malfunctions (I’m having a like/hate relationship with the Canon 20D). Then over the next week my back and knee on my left side were killing me along with the sunburnt feel. Getting only a couple of hours of sleep a night ain’t no fun when you feel like you’re being stabbed by a thousand knives. On Sept. 10th after a long day of work, late at night driving home from a football game it dawned on me…I probably had shingles. I had a small rash on my back that I assumed was from the balm I put on my back to ease my pain. And let me tell you that using aspirin, Tylenol or other OTC painkillers are like using tissue paper to protect against a shark’s bite with the pain. So of course I realize this on a Saturday night and I spend another two torturous nights before I see the Doc on Monday. Sept. 12th and I finally see a Doc who confirms what I have and the rash is spreading from my back to my stomach, a somewhat confined area to my left side. At least I get some ‘real’ pain meds and anti-viral meds. Also I find, after asking, about how contagious I am. Because it’s limited in area, and I usually wear a shirt, spreading it is a very, very low proposition. Not unless someone wants to pop a blister and snort the contents which would be about the only way (a nasty thought). They aren’t even normal blisters, more like mosquito like bumps, they ain’t juicy. So here I am four weeks after first getting it. I’m much better, the pain went from 1,000 knives stabbing me in the first week or so, to feeling like a unpracticed guru sleeping on a bed of nails, to pain now reduced to only feeling like I’ve been punched in the stomach or kicked in the nuts once in awhile along with some backache and the sunburn feel and some skin numbness. So pain medication is still needed, but not often at all. 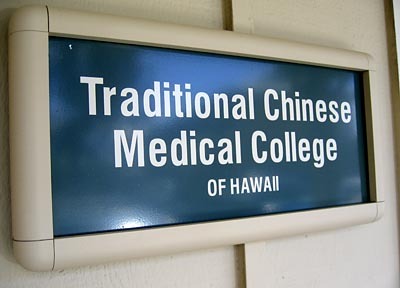 Oh yeah, I’ve also gone for acupuncture treatments at the Traditional Chinese Medical College in Waimea. Got a great gal Beth doing Japanese acupuncture on me. The Chinese style leaves the needles in you while Japanese style has them stick you (or me), they manipulate the needle and pull it out, then do it again in another spot. Also getting moxa which involves putting a tiny pinch of herb (not the smoking kind) on the skin and lighting it afire. They also bled me of a few drops of blood on my toes *ouch! * and the usual tounge examination and pulse reading. 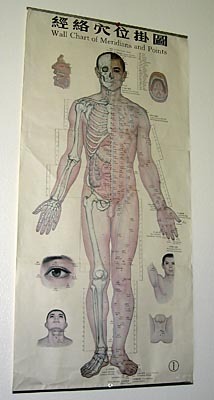 A chart in the treatment room. I had a person shoot a photo of me with the needles in but the photo came out blurred…amateurs. I’ll have to shoot some photos myself during my next treatment. If you really want to see what shingles look like click on this link. Did you think it was gonna be easy to look at?